Mild enough looking dude to be so powerful. Never heard of him? Grover is an American political advocate who is founder and president of Americans for Tax Reform, an organization that opposes all tax increases. Well that’s okay, as there are a lot of people who oppose tax increase for one ideological reason or another and that’s their own business. But Grover is different and that difference has given him unprecedented influence over the Republican side of Congress, even though he’s never been elected to any public office and is not a big campaign contributor like the Koch brothers or various PACs. Arguably, his power over the Republican side of American politics makes him a sort of shadow-legislator of enormous significance. Slightly over 90% of the money it takes to run our American government comes from individual and corporate income taxes. For the past 23 years, since 1992, Grover has effectively handcuffed the Republican representatives in our Congress from raising those taxes. He’s done that by an initially innocent means that has come to be toxic. In the political environment of 1992 it was relatively easy to get Republicans to sign on to a ‘no tax increase’ pledge. Bill Clinton had raised taxes and paid down a portion of the national debt and Clinton was not popular among Republicans. That pledge has since become poisonous to the democratic process, because it’s inviolable. Repeatedly since 1992 any Republican who broke that ill thought-out pledge has been defeated for re-election by merciless negative campaigning by Americans for Tax Reform. All perfectly legal, but legislatively crippling. Running scared on a single issue as fundamental as funding government essentially shuts down the bi-partisan process. Grover has said "My goal is to cut government in half in twenty-five years, to get it down to the size where we can drown it in the bathtub" and he’s done a pretty good job of that. Article I, Section 8, Clause 1 of the Constitution reads: The Congress shall have Power to lay and collect Taxes, Duties, Imposts and Excises, to pay the Debts and provide for the common Defence and general Welfare of the United States; but all Duties, Imposts and Excises shall be uniform throughout the United States. So we can ‘lay and collect’ taxes and already agree that income taxes are the major source of that income. What Norquist has so successfully achieved is to keep those taxes from being raised in any case, no matter the changing needs of the country. The national complaint over gridlock is actually cause and effect. The cause is an inability to increase revenue to meet growing need. The effect is soaring national debt and stripping the needy of what little they have left. Since 1992 America has fought a number of unfunded wars and ‘military actions,’ as well as suffered a major economic meltdown—all without the power to increase income from taxes. Consider the fact that because of Grover Norquist’s pledge, we no longer have a say over whether this is an America that reflects our individual (and widely varied) values. If all this seems to you like whining and crying by a wild-eyed and defeated liberal, it is not. I am perfectly content to watch the American legislative process function as it has for centuries—sometimes swinging liberal, sometimes conservative. I have not always agreed with either direction, but I accept the mood of the country and its circumstances throughout those swings. I was appalled during the McCarthy anti-communist hearings of the 1950s, but at least Joe McCarthy was an elected Senator from Wisconsin and the Senate chose to censure him for his conduct. Likewise, I feel the Citizens United cause (opening unlimited corporate funding of elections) is a mistake, but its legality was confirmed by the Supreme Court. What I do not accept is the capture of one of our two parties by an unelected private citizen that effectively removes their legislative choice. Many elected Republicans agree. Alan Simpson, the former Republican Wyoming senator who co-chaired the White House fiscal commission which proposed trillions of dollars in new taxes -- and earned accolades from the Beltway establishment has fervently attacked fellow Republicans for their allegiance to Norquist's pledge. "For heaven's sake, you have Grover Norquist wandering the earth in his white robes saying that if you raise taxes one penny, he'll defeat you," he told CNN back in May. "He can't murder you. He can't burn your house. The only thing he can do to you, as an elected official, is defeat you for reelection. And if that means more to you than your country when we need patriots to come out in a situation when we're in extremity, you shouldn't even be in Congress." Georgia Senator Saxby Chambliss ditched Norquist's pledge last Thursday. "I care more about my country than I do about a 20-year-old pledge," he told a Georgia TV station. "If we do it his way then we'll continue in debt, and I just have a disagreement with him about that." Asked if he fears a possible primary challenge, Chambliss said, "I don't worry about that because I care too much about my country. I care a lot more about it than I do Grover Norquist." South Carolina senator Lindsey Graham said again Sunday that Republicans should be willing to lower the debt with new tax revenues. "I think Grover is wrong when it comes to, 'We can't cap deductions and buy down debt. I'm willing to generate revenue." When you're $16 trillion in debt, the only pledge we should be making to each other is to avoid becoming Greece and Republicans should put revenue on the table. We're this far in debt. We don't generate enough revenue." So there are reputable conservatives who are willing to stand up to the tyranny of Grover’s pledge and cracks are beginning to show around its edges. But a massive amount of damage has been done in the 23 year interval. 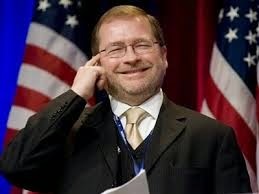 Grover Norquist has been elected or confirmed by no one. He stands as an icon to all that can go wrong in political maneuvering—in the quiet, behind the scene and beyond the notice of the average voter.